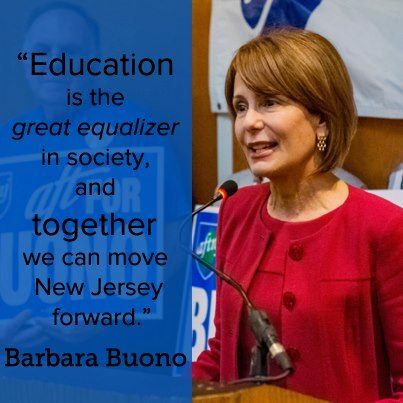 On April 18, 2013, NJ State Senator Barbara Buono visited her alma mater, Montclair State University to accept the endorsement of AFTNJ in her bid for Governor of New Jersey. Among those to welcome her back to campus were Bill Batkay, retired Professor of Political Science, who Sen. Buono remembered as one of her professors. Sen. Buono said, in response to Gov. Chris Christie's remarks that unions, not teachers, are the problem with public education, "Unions aren't the problem. Your misplaced priorities are the problem." Sen. Buono pointed out that Gov. Christie cut $180 million out of the 2011 state budget for education, and even though he made restorations, the budget for higher education is still five percent below where it was when Gov. Christie took office. 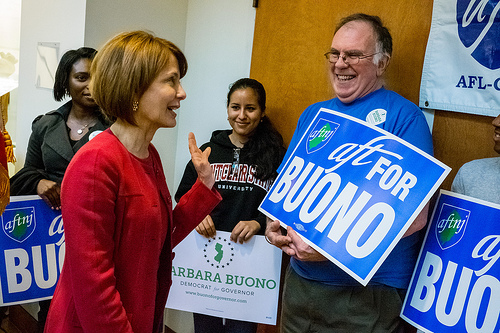 Sen. Buono has a 92% labor record. She told the crowd, "I stand up for the teachers and the students. Education is the great equalizer. I am proud to stand with the AFT." Senator Barbara Buono On Campus! To Create A Sea of Blue Part 2! Thursday, April 18th @ 4:30 p.m.
On Saturday, April 13th, members of AFT Local 1904 helped out at the Mount Pleasant Animal Shelter and got to meet some of the cute guests waiting for their forever homes. Many thanks to Susan Hagen, Louise Davies, Liz Blades, Jennifer Higgins and Naomi Liebler for assisting the shelter with preparing for its annual tricky tray fundraiser and washing litter pans. There is still time to help the Mount Pleasant Animal Shelter by contributing the AFT Local 1904 donation drive. Spring brings many litters of feral kittens and the shelter is preparing to receive them. Please help us "Make A Difference Every Day" by purchasing some supplies. The drive ends April 30th. 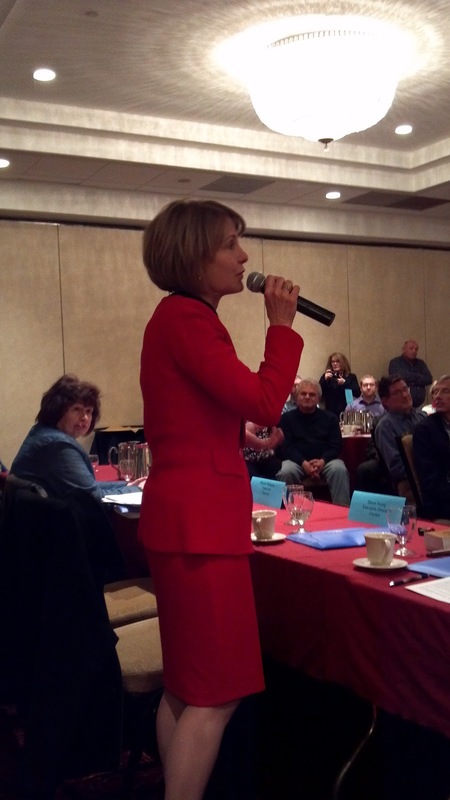 At the April 5, 2013 meeting of the Council of NJ State College Locals (CNJSCL), Senator Barbara Buono met with the delegates and shared with them her vision for New Jersey. 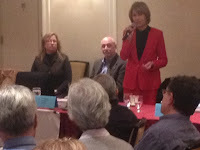 Senator Buono told the crowd that she wants to see a New Jersey that provides this generation the same opportunities she had. 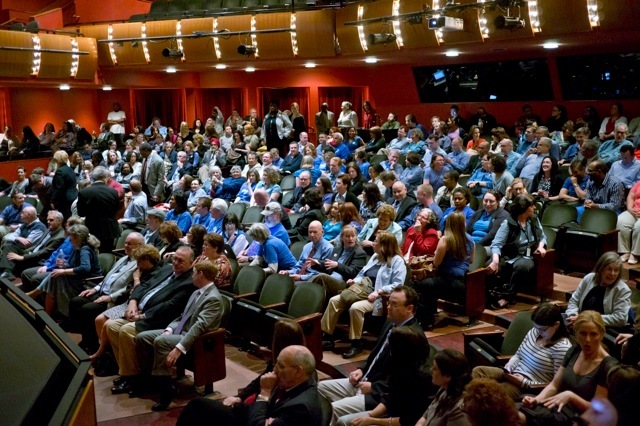 On April 4, 2013, Rich Wolfson, President of AFT Local 1904, addressed Montclair State University's Board of Trustees during which he congratulated five of our colleagues who were granted emeriti status, talked about the work professional staff do, spoke to the issue of essential personnel, commented on a contract concerning the recruitment of international students, and implored the Trustees to consider the stories of our students and Dreamers concerning increases in tuition and fees. Read his full statement by clicking here.